Have you heard of any of these? Mindfulness meditation – of which there are many variants, and my NEW book (out soon) will give you the best one. Concentration meditation – is single-pointed-focus and there are numerous things you can put your focus on. Meditating on the breath – can emphasise either mindful awareness or single-pointed-focus using the breath as your focal point. Visualisation meditation – uses your imagination to impact your body, mind and emotions. Visualisations abound on Youtube – some good, some OK, and some not. Movement meditation – utilises mindful awareness and focused attention – eg: Yoga and Tai Chi can be practised in this way. Mantra – uses sound and rhythm (or focusing on the vibrations in the body) to get you into single-pointed-focus. TM (Transcendental Meditation) utilises a mantra. There are lots of systems which use the common components of meditation in various ways to help people make changes – some of them become almost a religion for their devotees. Well, with all these TYPES of meditation practice, it cannot possibly be one thing. I know most teachers say, “This is how you meditate” then show you their favourite way of engaging with meditation. I do the same, just with a footnote about other types – but it is evident there are many ways to meditate. Not to be confused with “Any way you think you could be meditating is meditation“. NO! I explain exactly what meditation is in my FREE course – where you discover the 3 DNA components of all meditation, without which it is NOT meditation. I hope you enjoyed busting this myth. The course below will further your understanding. If you already meditate, feel free to share it. If you have any questions or comments feel free to join my list for updates because, apart from finding out when the next blog posts go up and my FREE online courses, you can also contact me by replying to my newsletter/emails. 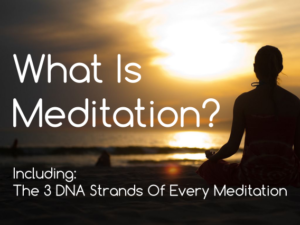 Today’s course is about “The Three DNA Components Of ALL Meditation“, where I give you the inside scoop on the details many meditators do not know – yet if they did, this knowledge would help them gain more from their meditation practice. If you haven’t started meditating yet, this will put you ahead of the game, quickly and easily.